A cheerful holiday greeting sent during the Great Depression? Isn't that somewhat contradictory? 1933 was a difficult year. Unemployment reached 25%, and gross domestic production was way down. The New Deal programs designed to boost the economy had not yet begun to achieve the helpful effects that would come in the next few years. Times were hard for many people across the United States and elsewhere in the world. Despite the glum economic situation, the Pinero family used a brown paper bag to fashion an inexpensive holiday greeting card. They penned a clever rhyme and added some charming line drawings of Mom, Dad, and the kids with the message: "Oh, well—in spite of it all—here's a Merry Christmas from the Pineros." 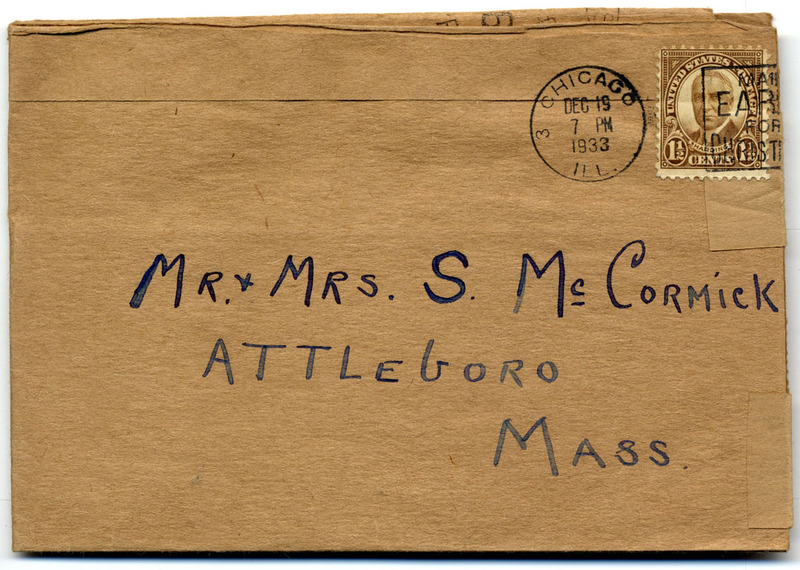 On December 19, 1933, they mailed it from Chicago to friends in Massachusetts, using a one-and-a-half-cent stamp. For a minimal outlay of cash, they were able to keep in touch with friends and comment on their reduced circumstances with wit and humor. We hated to reveal it. We struggle to conceal it. And need not fear confession. Now seems within all reason. Best wishes of the season!" This hand-lettered poem is a delightful example of light verse, a whimsical form of poetry intended to entertain or amuse, even if treating a serious subject in a humorous manner. In the poem, the Pineros suggest that they had struggled economically for some time, but now, due to the continuing Depression, others shared their financial plight, which enabled them to be more open and candid about their situation. Like many families, the Pineros probably had lots of bills for necessities including rent, groceries, utilities, milk, and ice. Because not every family had electric refrigeration in 1933, many relied on regular deliveries of ice to keep their perishable foods cold. These bills for milk and ice were separate; they were not part of the grocery account. Local dairies supplied milk and other products on a daily basis. Both the Ice Man and the Milk Man would cometh, as long as they were paid! While we've done some searching in various places such as city directories and genealogical resources, we haven't yet been able to identify the senders, the Pineros. This card was saved by the recipients, the McCormicks of Attleboro, Massachusetts. It was donated by their son Peter McCormick, who wrote that he never knew the family who sent it to his parents in 1933.